Depending on your state’s laws, your marital settlement agreement may address a wide variety of topics. Such settlement agreements typically address property division, child custody, child support and alimony. Your ex-spouse may breach this settlement agreement by withholding alimony or child support, breaking the terms of the custody plan, failing to pay debts as agreed or failing to turn over money or property. Often, a court-ordered divorce decree adopts the terms of a marital settlement agreement, which then gives the settlement agreement the same power as a judge’s order. Thus, the court can find the spouse who doesn’t comply with the decree or agreement in contempt of court. If you are found in contempt of court, you can be fined or even sent to jail. Laws about child support vary between states, but all states have laws designed to make it easier for a parent to collect child support if the other parent does not pay as ordered. The court can order that child support and alimony payments be withheld from the paying spouse’s paycheck. State agencies can also help you collect back child support payments, including interest, if your ex-spouse doesn’t pay. Your state can intercept your ex-spouse’s tax return and revoke his driver’s license or professional license. The federal government also can get in on the act by intercepting federal tax returns and revoking his passport. If your ex-spouse breaks terms of your settlement agreement, you can file a motion with the court to enforce the agreement or, if the agreement was incorporated into the divorce decree, to enforce the decree. Generally, you will file this motion with the court that issued the decree since you are asking the court to enforce its own orders. Once you file the motion, you must also serve a copy on your ex-spouse to give him an opportunity to respond. If you and your spouse disagree, the court will likely order a hearing to receive evidence and issue a decision. How Do You Get Equitable Distribution Enforced in a Final Decree of Divorce? During a divorce, the term "equitable distribution" refers to the division of assets and debts acquired by one or both parties during the marriage. A divorce decree or judgment will state in writing the terms of the equitable distribution and both spouses will be bound by those terms. In some circumstances, your ex-spouse may not comply with the equitable distribution terms in your divorce decree. If that occurs, you must go back to court to get a judge to remedy the situation. 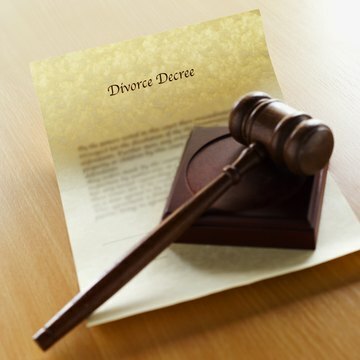 Can I Sue My Ex-wife for Breaking the Divorce Decree?